Seriously, what the hell? Anyway, I tried the Cheeseburger and Buffalo Chicken versions, mainly because they didn’t have the Sloppy Joes at Target. They’re actually pretty good. Unlike regular Hot Pockets, Sideshots don’t include crisping sleeves, but they manage to keep the bread soft and flaky. The Cheeseburger Sideshot tastes EXACTLY like a fast food cheeseburger you’d get from McDonald’s or Burger King. It’s uncanny, and somewhat reminiscent of the cheeseburger-flavored Doritos, although less creepy. I was a little less crazy about the Buffalo Chicken, but it was still pretty decent quality chicken meat. Dipping it in Ranch dressing helped a lot, and the shape and style of the bun made dipping an easy and fun option. I'm honestly slightly surprised they don't have a picture of one with a hat and glasses cowering in terror. 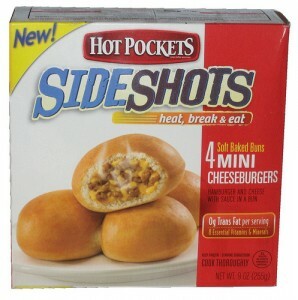 Hot Pockets Sideshots come four to a box, packaged in pairs. In my experience, it takes about four to make a satisfying meal, but two could be a nice quick snack option. They cost about $2 per box, which is a pretty good deal. I wouldn’t get them every time, but the Sideshots are a nice change of pace from the usual Hot Pockets. Hot Pockets. You may have heard of them. A pastry-style crust wrapped around a usually meat and cheese based filling. It’s designed to be heated up in the microwave in a cardboard sleeve to maximize crispness. Is it a sandwich? Strictly speaking, no. But Hot Pockets make up a pretty large part of the frozen meal section of most grocery stores, and they’re sandwichlike enough for me to count them. 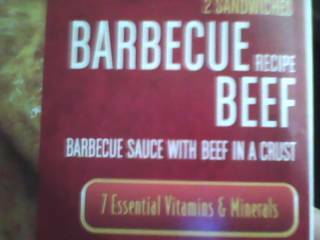 “Barbecue Sauce with Beef in a Crust.” As though the beef was just an afterthought, when people complained a big BBQ sauce Pop-Tart was too runny. Advertising missteps aside, the Barbecue Beef Hot Pocket is actually pretty good. The beef isn’t the highest quality, but it’s a bit thicker than lunch meat so it has some texture to it. The barbecue sauce itself is actually really good, sweet while still maintaining a bit of spice. All in all, it tastes like a barbecue pulled pork sandwich, which isn’t bad at all. The second Hot Pocket I tried was the Steak and Cheddar Panini. You may remember it from the TV ads which reminded you that “you know it’s a Panini because of the marks on it! !” (This is not how a Panini works.) The Steak and Cheddar Panini isn’t too bad. The crust is flakier and better tasting than the average Hot Pocket, and the shape of it is more similar to a sandwich. The steak and cheese are fine, nothing too noteworthy but definitely worth eating. The one issue with the Panini line is that they’re about twice as big as normal Hot Pockets, but you only get one per box, as opposed to the normal two. That, combined with the triangular, sandwich-like shape, means that these Hot Pockets are designed as meals, rather than the quick, on-the-go option they’re known for. 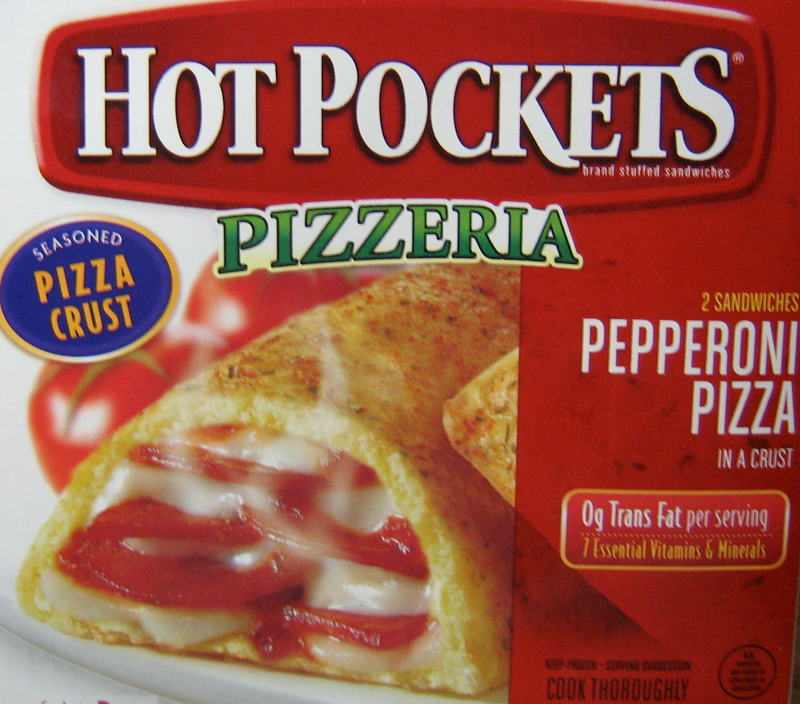 Hot Pockets are a quick and easy sandwichesque option. They’re pretty good, and they go for a couple of dollars at most grocery stores. While they’re not nearly as high quality as most restaurant sandwiches, they’re perfect for the busy sandwich aficionado.